The Delta smelt has not yet become extinct, but the numbers of fish collected in the fall 2016 midwater trawl survey conducted by the California Department of Fish and Wildlife (CDFW) remain alarmingly low. This is in spite of improved precipitation last winter and spring, followed by a wet fall that should have resulted in much higher numbers of smelt surviving. 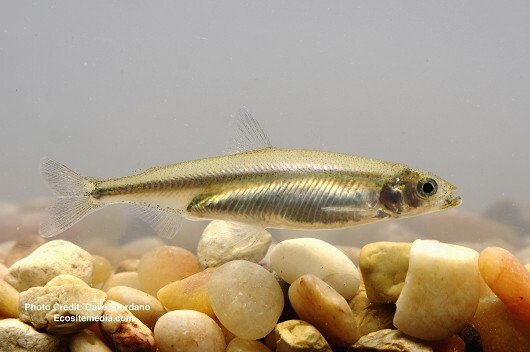 The small 2 to 3 inch fish, found only in the Sacramento-San Joaquin River Delta, is an indicator species that demonstrates the relative health of the largest estuary on the West Coast of the Americas. The species is listed under both the state and federal Endangered Species Acts. When the numbers of Delta smelt are so low, it reveals that the estuary, as we know it, is just as close to extinction as the fish themselves. The numbers of smelt found this year and last contrast with 2011, a wet water year, when the Delta smelt index increased to 343, and then quickly plummeted again during the drought. Delta smelt abundance was highest in 1970 with an index of 1673 recorded. The index for longfin smelt, a native species that is a cousin of the Delta smelt, was also dismal. The index was 7, the second lowest in fall midwater trawl (FWT) history. Five longfin smelt were collected at index stations in San Pablo Bay and Suisun Bay. Only last year’s survey showed a lower number, an index of 4 , the lowest on record. The highest number of longfin smelt ever recorded was in 1967, when the index was 81,783. The index surged up to 477 in 2011, but rapidly declined in the ensuing years during the drought as water exports to agribusiness and Southern California water agencies by the state and federal governments continued. Jennings attributes the low smelt numbers to the lack of badly-needed higher river flows into the estuary, caused by series of temporary urgency change petitions granted by the State Water Resources Control Board to waive water quality standards in the Delta. The TUCPs also have a detrimental impact on winter-run, spring run and fall-run Chinook salmon. “The December 2016 Kodiak Trawl Survey collected 214 Delta smelt in one of its nine trawls, and at least one Delta smelt was captured in each of the other eight trawls,” wrote Cannon. Unfortunately, this opportunity to help recover the species will be lost if the U.S. Fish and Wildlife Service leadership continues to reject the recommendations of state and federal scientists, emphasized Jennings. Other pelagic (open water) fish collected in the fall midwater trawl survey showed some improvement, though nothing even close to historical abundance. The striped bass index improved in 2016, going up to 124 from 52 in 2014. This is still a dramatic decline from historic numbers. By contrast, the index in 1967 was 19677. The abundance index for American shad, a once abundant anadromous member of the herring family avid pursued by anglers when it migrates up the Central Valley rivers to spawn in the spring, rose from 79 in 2015 to 313 in 2016. That’s the highest index since 2012. The CDFW collected 249 shad at their index stations this fall. The record number of shad recorded was relatively recent in 2003 when an index of 9360 was recorded. Threadfin shad, an introduced baitfish species related to American shad, declined in the midwater trawl survey from 806 in 2015 to 660 fish this fall. The 2016 abundance index is the eighth lowest in history. 2001 was the record year for threadfin shad in the survey, with an index of 14401 recorded. Sacramento spllittail, a native minnow found only in the Delta and Central Valley, continued its decline, with no fish recorded either in 2015 or 2016. The Delta smelt collapse is part of an overall ecosystem decline, including dramatic reductions in winter, spring and fall-run Chinook salmon and steelhead populations, driven by water diversions by the federal and state water projects. From 1967 through 2015, populations of striped bass, Delta smelt, longfin smelt, American shad, splittail and threadfin shad declined by 99.7, 98.3, 99.9, 97.7, 98.5 and 93.7 percent, respectively, according to Jennings. While the management of Delta fish species by the state and federal governments is bad now, if will get only worse if Governor Jerry Brown makes a deal with incoming President Donald Trump to fast-track his Delta Tunnels project. Governor Jerry Brown and other state officials have constantly claimed the Delta Tunnels project will “restore” the Delta ecosystem, but they recently revealed their real plans when the administration applied for a permit to kill winter-run Chinook salmon, Central Valley steelhead, Delta and longfin smelt and other endangered species with the project. The construction of the two 35-mile long tunnels under the Delta would hasten the extinction of Central Valley steelhead, Sacramento River winter-run Chinook salmon, Delta and longfin smelt, green sturgeon and other fish species. The project would also imperil the salmon and steelhead populations on the Trinity and Klamath rivers, a fishery that for thousands of years has played an integral part in the culture, religion and food supply of the Yurok, Karuk and Hoopa Valley Tribes.